If you like regular Frosted Mini-Wheats Bite Size cereal, you'll probably like this cereal as well. The reason is because they taste dramatically similar. Little Bites are about half the size as Frosted Mini-Wheats Bite Size. They have a sort of orange frosting that turns a deeper rust red in milk. When you open the box, the fragrance of the cereal indicates that you're in for something new. The cereal smells distinctly nutty. The odor reminds me of Honey Nut Nougat candies that were popular with grandmothers in the 1970's. So, does it taste nutty and new? No. Something happens when you add milk to this cereal. You have to concentrate to taste any trace of what you earlier recognized as a sweet, nutty odor. This cereal could be promoted with the gimmick, "Add milk and watch the frosting turn rusty and be amazed as the unique flavor disappears." With all that said, I like Frosted Mini Wheats so I liked this new cereal. If you like Frosted Mini-Wheats and want to try them in a smaller size, give this cereal a try. It's slightly sweeter than Frosted Mini-Wheats Bite Size. If you're looking for a new and exciting flavor, keep moving down the aisle. As for nutrition, Little Bites have almost the exact same profile as the Bite Size cereal. Both have 6 grams of dietary fiber, 12 grams of sugar and 1 gram of fat. Little Bits have 1 less gram of protein per serving and 10 fewer calories per serving. 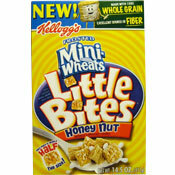 What do you think of Frosted Mini-Wheats Little Bites - Honey Nut? Why can't you buy this cereal anymore. This was the best cereal I have ever ate in my life. I was hooked from my first bowl. I would love to share them with the whole family. Please bring them back. This was my favorite... what happened to it?! Not only did I love it, but my three year old loved it too. Please, please, please bring this one back. This was my all time favorite cereal! My routine was: get home from work around midnight, change into pajamas, pour a big bowl of cereal, curl up on the couch, watch the day's shows on the DVR, then go to bed happy! Bring it back! I also am disappointed the honey nut flavor has been discontinued as they were my all time FAVORITE. Please bring Them BACK. I also purchased multiple boxes but Have since been able to find them anywhere. They are Grrrrrrreat! Please bring them back! Kelloggs is so crazy for discontinuing this cereal. Before they discontinued these I use to buy Anywhere from 5 to 10 boxes at a time because I could never find them in any stores other then Wallgreens. I don't know how this guy can say they taste exactly like regular frosted mini wheats because they don't at all. Maybe he needs to get his taste buds checked. Please kelloggs bring this cereal back, it was the best tasting cereal out there. I don't even eat cereal anymore because nothing else came close. Please bring them back. Thank you. This is the best cereal I have ever eaten, please bring it back, PLEASE!!!!!! 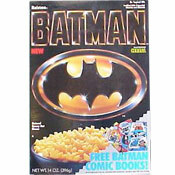 I love this cereal... where did it go?!?! I Have Seen The Ad For It, But Who Would Eat That?????? It Is Just One Of Those Junk Cereals. It Has Fiber Though, Which Is Very Good For You!!! I think this product is discontinued. I can't find it on the Kellogg's website. Too bad, it was so good! I'm having trouble finding them... I love them need help finding them. My favorite cereal! I buy it at boxes at a time and have asked my local Food Lion to bring it back! I'm eating them right now, and they're so delicious! I really like this cereal. I like the smaller bites and the taste of honey. Just got a box, they light up your mouth with flavor. I think I am stuck on these for a time. Chris Hampton, Va. I JUST had a bowl and I love it. I don't add too much milk to my cereal though because they soak up so much milk and I don't like for them to get soggy, so I tastes the honey nutness (Lol) and was happy with it. Mmmm! My new fav. The new kind of Mini-Wheats are great for small children.